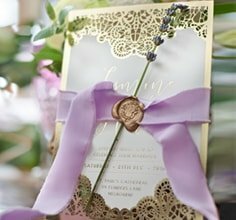 Created for the modern woman and the young at heart, this chic creation is the best announcement card for your intimate wedding in an outdoor setting. The textured laser cut cover and the opulent foiling on the front is glamourous as it allows the colour of the inner card to peek through as a vibrant background colour. The watercoloured pink hues applied digitally to the insert card offers a dramatic yet grounding vibe that complements the ebony raised ink lettering of your names and love heart. We ordered a sample of the modern laser save the dates. Wow absolutely beautiful! We had quoted locally to make & print our own save the dates but ended up costing more. Definitely happy with the price and quality of the save the dates from Giant Invitations!! The paper quality is great, the intricate design on the laser cut front is amazing. And conveniently envelopes are included so that makes it easier!